You can assign an individual PCIe endpoint (or direct I/O-assignable) device to a domain. This use of PCIe endpoint devices increases the granularity of the device assignment to I/O domains. This capability is delivered by means of the direct I/O (DIO) feature. The DIO feature enables you to create more I/O domains than the number of PCIe buses in a system. The possible number of I/O domains is now limited only by the number of PCIe endpoint devices. Note - Because root domains cannot have dependencies on other root domains, a root domain that owns a PCIe bus cannot have its PCIe endpoint devices or SR-IOV virtual functions assigned to another root domain. However, you can assign a PCIe endpoint device or virtual function from a PCIe bus to the root domain that owns that bus. The following diagram shows that the PCIe endpoint device, PCIE3, is assigned to an I/O domain. 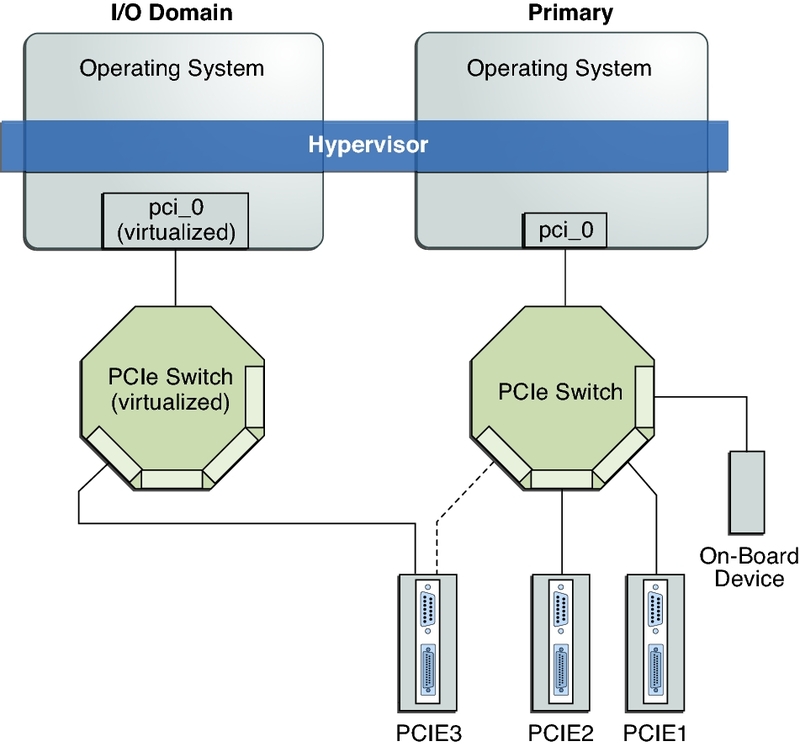 Both bus pci_0 and the switch in the I/O domain are virtual. The PCIE3 endpoint device is no longer accessible in the primary domain. In the I/O domain, the pci_0 block and the switch are a virtual root complex and a virtual PCIe switch, respectively. This block and switch are similar to the pci_0 block and the switch in the primary domain. In the primary domain, the devices in slot PCIE3 are a “shadow” form of the original devices and are identified as SUNW,assigned. Caution - You cannot use Oracle Solaris hot-plug operations to hot-remove a PCIe endpoint device after that device is removed from the primary domain by using the ldm remove-io command. For information about replacing or removing a PCIe endpoint device, see Making PCIe Hardware Changes. Use the ldm list-io command to list the PCIe endpoint devices. Though the DIO feature permits any PCIe card in a slot to be assigned to an I/O domain, only certain PCIe cards are supported. See Direct I/O Hardware and Software Requirements. Caution - PCIe cards that have a bridge are not supported. PCIe function-level assignment is also not supported. Assigning an unsupported PCIe card to an I/O domain might result in unpredictable behavior. This feature is enabled only when all the software requirements are met. See Direct I/O Hardware and Software Requirements. Only PCIe endpoints that are connected to a PCIe bus assigned to a root domain can be assigned to another domain with the DIO feature. I/O domains that use DIO have access to the PCIe endpoint devices only when the root domain is running. Initializes and manages the PCIe bus. Handles all bus errors that are triggered by the PCIe endpoint devices that are assigned to I/O domains. Note that only the primary domain receives all PCIe bus-related errors.